Deciding to take a much needed mid-summers break late the past July, I made my way out to Los Angeles, California for a little fun in the sun. I landed at the Burbank airport which I love based on how easy it is to fly in and out of vs. LAX. Grabbing my luggage I walked out into the sweltering July LA sun… and thought “Ouch…it’s gonna be hot walking around amusement parks all day!” A few minutes later I was picked up by one of my good friends, Doyle Wolfgang Von Frankenstein-guitar player for the Legendary punk rock band The MISFITS and currently of GORGEOUS FRANKENSTEIN. He was accompanied by his Wife George Frankenstein- formerly known as “Gorgeous George” and Randy “Macho Man” Savages’ former valet from WCW wrestling. We had a busy week planned out including Disneyland, Hollywood, visiting other friends, the beach, and I had to go check out the new “House Of Horrors” Attraction. 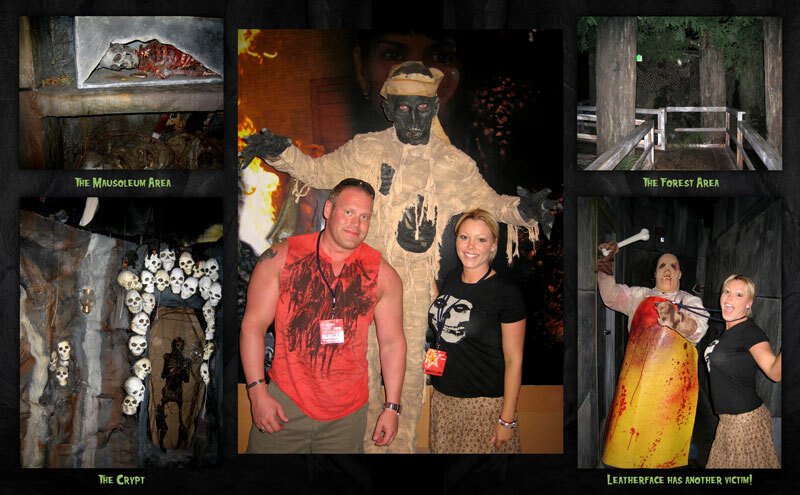 I had to see how this “House Of Horrors” held up against my “House Of Horrors” attraction here in Buffalo! A few days into the trip we made our way to Universal Studios Hollywood. I Spend a lot of time in California as I have tons of friends out there. I usually go to Universal Studios Hollywood at least once a year, but was more excited than usual to check out a new attraction-especially a haunted attraction! Once in the gates we made our way straight over to “Universal’s House Of Horrors” The first thing that catches you is the Impressive facade that must be seen to be believed! Just standing at the bottom of the staircase leading into the attraction is enough to send shivers down your spine! I had visited this attraction over the years when it was themed on the new Universal “Mummy” movies, as well as when it was themed on the “Van Helsing” movie. I was hoping Universal didn’t just paint over some of the sets and change a few props around. Fortunately I was pleasantly surprised! Walking into the lobby I couldn’t believe my eyes-Posters, props, and memorabilia from horrors movies of years passed filled the large que line area. After wandering around and checking out all the cool stuff including an original Chucky Doll from the “Childs Play” movies and Hannibal Lecters’ mask we made our way to the entrance. As we entered through the darkness and into the first area of the House Of Horrors I immediately noticed that it was completely different from the previous “Van Helsing” haunt. As I walked by an old blocked up archway, lightning crashed andthe stones disappeared as I came face to face with an amazingly detailed Bela Lugosi Dracula figure. Very great effect that I didn’t see coming. The room also held an ancient looking rusty metal archway with hundreds of red eyes blinking at you.. Very cool indeed! We ventured through the first scene and made our way through the rest of this very impressive haunt. Throughout the roughly 7 minute tour we traveled through the castle via staircases, mirror mases, catacombs, and amazingly detailed scene after scene coming face to face with legendary screen monsters such as The Phantom Of The Opera, The Mummy, Nosferatu, Mother Bates from “Psycho”, Chucky From “Childs Play”, Frankensteins Monster, the Wolfman, and a Leatheface-esque chainsaw wielding maniac. One thing that really impressed me was the amount of actors throughout the attraction. We went through the House Of Horrors 3 times that day, and they had so many scares designed throughout the attraction that we constantly got scared with different scares from different spots each time through! The actors were very animated and into it-you could tell these guys were having a blast scaring all the patrons that day! One plus for the workers on a 90 some degree day was that the attraction was nicely air conditioned….It was a fun and refreshing break from the heat each time we went through! The scares pretty much didn’t let up from the moment we walked in. They really had it down… there was one creature or another popping out at us from every corner, and really no dull moments throughout the whole attraction! One of the highlights was the “Child Play” room. Set up like small childs playroom, toys and stuffed animals littered the area. We were chased through the room by a feisty mummy who jumped out of his crypt and nearly made the group in front of us cry! The first time we walked through this room there was a giant Chucky doll hanging though the wall in a pile of raggedy old stuffed animals. The second time we went through the giant Chucky doll came to life, bursting through the wall and scaring the living hell out of me. I wasn’t expecting this at all-it was a great and unexpected scare! We had walked through a few hours before and it seemed as almost every scare was coming from a different spot than last time. That gave it a nice twist, as I didn’t know where the actors were going to burst out from this time! 2 thumbs up to all the actors, as they all did a great job that day! Another very impressive scene was the Wolfmans Forest. It looked to me as Universal had removed a huge section of forest from the old E.T. ride after it was shut down and moved it over to the House Of Horrors. This section of the haunt was done very well. A creepy dark forest complete with the all familiar forest scent that I use in my own haunts! The lighting was done just right, and with these giant trees surrounding us, I was just scoping the whole area to try and see where the actor was going to pop out. Then, BAM… the Wolfman came tearing out of the trees scaring the girls in front of us down to the ground! I love it!! One of the cool things inside the House Of Horrors was lots of staircases going up and down that gave you the effect that you indeed were inside of a big, haunted castle. Halfway through the attraction we walked over a bridge high in the air overlooking an UNBELIEVABLE Frankenstein set, which has to be seen to believe. You could see other patrons down below getting scared from up on the bridge. The scope of how big and detailed this area is is amazing. 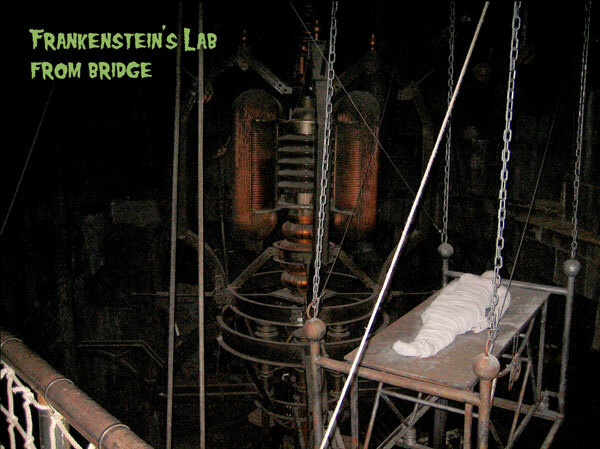 After venturing through other areas of House Of Horrors you end up downstairs and make your way through the elaborate Frankensteins laboratory on ground level. This was probably my favorite part of the attraction, each time we walked through, I was just looking around this set in awe… wish I could move this set to my place in Buffalo! Haha.. I was disappointed with the sets as I walked through, as Universal Studios did a fantastic job on making this a world class haunt. As a big fan of Universals “Halloween Horror Nights” in Orlando and the unbelievable job they do on that event, I was curious as to what kind of job they could do on a permanent attraction. 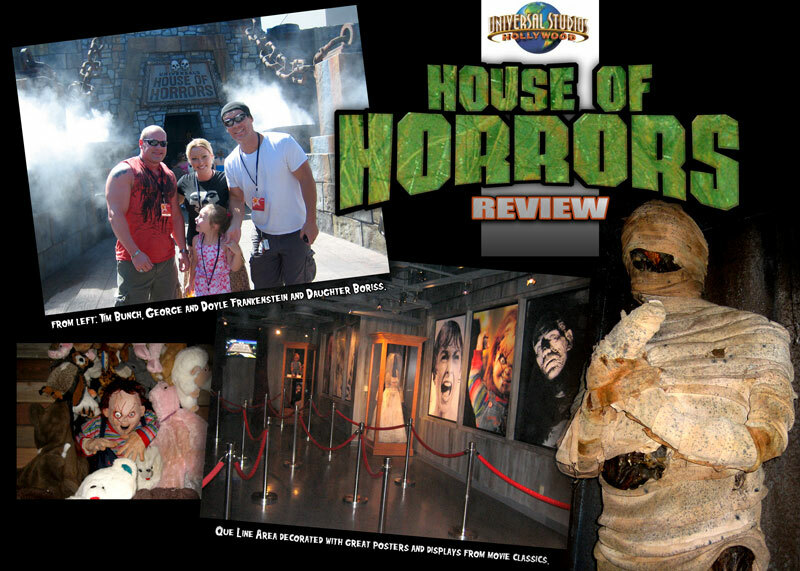 The end result left me extremely impressed, and the House Of Horrors has the same wow factor,level of detail, and thrills as most other Universal Studios attractions! And of course the rare occasion that you actually get to walk through the attraction, or ride through on a car makes it a very rare and refreshing amusement park experience these days. So if you get a chance to get out to California, or you are in the Los Angeles area be sure to spend a day at Universal Studios Hollywood and check out the House Of Horrors as well as all the other amazing attractions-including one of my personal favorites the Mummy Ride! I got many unique Ideas for my haunt exploring the House Of Horrors that I will incorporate this year and you will probably get great ideas as well!